Peter is a boy on his first trip to Greenland. He's accompanying his father who is doing research on global warming and his mother who is supposedly writing a book about mitochondrial DNA, but who is really spending all her time writing in a mysterious red book. Nothing can spoil this adventure for Peter... except maybe the weird things happening to his vision and the terrible headaches he's suddenly getting. Thea is a girl living in a secret community under the ice. Her people were nearly exterminated in the "wider world", but that was generations ago and Thea thinks that it's time they explored the surface. Supplies are running thin, but still Thea's grandmother (head of the Council) is determined that everyone will stay put. Suddenly Thea has some decisions to make when someone slips her a map that may show her the way out of their underground home. Peter and Thea will meet under dire circumstances and they will both have some tough decisions to make. But they might have more in common than either of them could have ever guessed. Before I picked up this title, I'd heard that it was a readalike for City of Ember by Jean DuPrau. 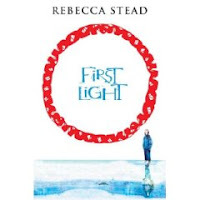 If your teens are anything like the teens at my library, they can't get enough of Ember and I'd certainly recommend First Light to quench their thirst for secret underground societies. I agree with the Booklist review that says "...[t]here are some gaps in Gracehope's invented mythology...", but I still found it to be a satisfying read. The twists weren't particularly surprising, but everything came together well. I especially liked all the parts about the dogs. In the undergound world Gracehope, each human is paired with a canine companion and some humans can actually understand the dogs "speaking". Altogether, I found this to be a solid science-fiction read. It started off a bit slow, but about 100 pages in, the action really took off and I couldn't put it down. I wouldn't hesitate to recommend this to a kid looking for sci-fi or for something to read after they've finished the Ember books.